Welcome to the Rotary Club of Belize page. The Rotary Club of Belize was formed in 1957 sponsored by the Rotary Club of San Pedro Sula, Honduras. In 2018, 61 years later, the current membership is 42 but will increase this Rotary year. Our Rotary Club is committed to helping our community on a regular basis. We are involved in our Gift of Life program by sending children to seek medical attention abroad for surgeries that cannot be done here in Belize, managing our prison system by having Rotarians on the Board of Directors of the Kolbe Foundation that is geared towards running a humane incarceration facility with the goal of prisoner rehabilitation, providing learning tools for improving technical & academic education in our city schools, establishing water and sanitation projects in our rural primary schools, assisting our senior citizens with wheelchairs to increase their mobility and so much more. 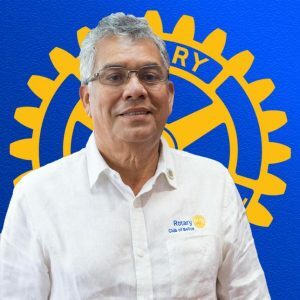 We are seeking professional and business persons who live in Belize City to become Rotarians who will help contribute to positive development of our Club and community. There are over 1.2 million Rotarians worldwide who come together in over 33,000 Clubs who give of their time and talent to make the world a better place. Come and join us. Our Rotary theme for this Rotary Year is “Be the Inspiration”. To do this in our community, we lead by example, we instigate ourselves and those we come in contact with into action and we arouse the passion as Rotarians to be the inspiration. Welcome to the Rotary Club of Belize’s official website. We hope you are inspired just as we have been and will continue to be.